What started the environmental movement? Rachel Carson’s response to the wanton use of DDT in her famous book Silent Spring. So, what started the environmental activist movement? 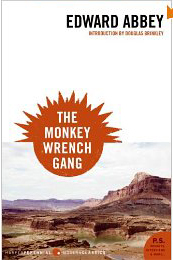 Edward Abbey’s novel about a group of misfits who rail against the development and destruction of the American West called The Monkey Wrench Gang. This is Abbey’s most famous novel and in addition to inspiring environmental activists everywhere, Abbey also entertains the reader through the comedic adventures of his characters. They attempt to blow up dams, take down bridges and destroy industrial equipment. They are not politically correct, and do not behave like “modern” environmentalists (for instance, they throw their beer cans on the side of the desert road!) but they are violent, unafraid, and true individuals. This is a classic American novel, and should be required reading for anyone who loves the American desert or has dreamed of resisting authority. This book will be discussed at Nature’s Narratives Book Discussion Group on November 8 from 5 to 6 pm. Please register to join us for the discussion and check out the other must-reads as part of this group! Sounds like domestic terrorism to me. Sounds like a controversial book club topic to me! Join us for our discussion!